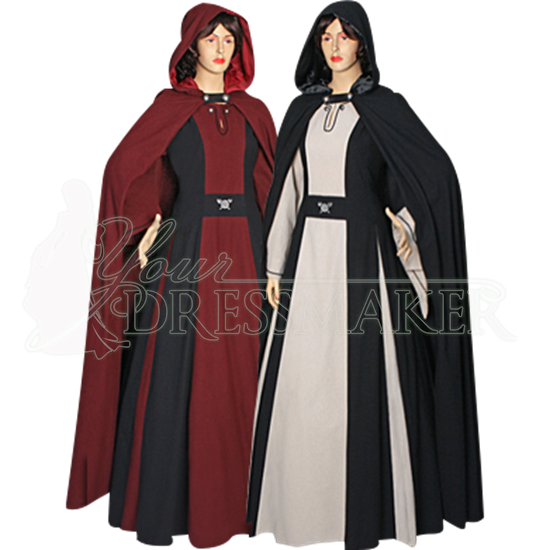 The Classic Medieval Maiden Dress is a beautiful, bi-colored dress that will successfully start to transform any modern-day woman into a beautiful medieval maiden. The dress is made from 100% natural woven cotton and is extremely adjustable. This dress is made from a medium-weight cotton fabric which strikes a healthy medium between weight, softness, and protection. This dress is comfortable to wear, as well as quite breathable. The dress is bi-colored, featuring a primary and a secondary color. The secondary color acts as an accent and as decorative trim. The main color makes up the front, back, and sleeves of the dress, while the secondary color accents the front and back, along with the sides of the skirt as well as the waistline. Subtle ornamentation decorates the neckline and the sleeves in the accent color as well. Two small metal medallions decorate the neckline, while a larger medallion decorates the waistline. The sleeves are loose-fitting and full-length. They end in decorative, flared cuffs that hang gracefully off the wrist and hand. The Classic Medieval Maiden Dress features lacing on the back, which makes the dress highly adjustable. Pictured above, the dress is worn with a petticoat underneath, in order to give the dress a more pronounced shape. The petticoat is not included but can be purchased separately. 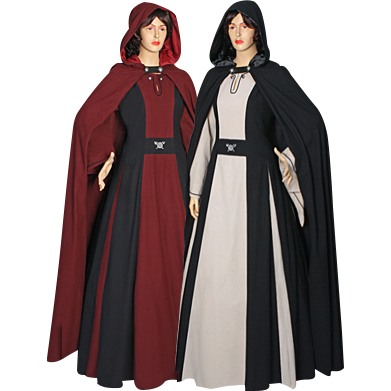 For a simple, yet beautiful dress, consider the Classic Medieval Maiden Dress. You will not be disappointed. When ordering, the first Color dropdown menu is for the main color of the dress (front panel, sleeves, skirt panels). The Accent Color is for the sides of the dress and the waist. For example, the burgundy and black option shown; Burgundy is the main color, Black is the accent color.